Western blot analysis of cell extracts from Baf3, 32D, and mouse spleen using HS1 (D5A9) XP® Rabbit mAb (Rodent Specific). 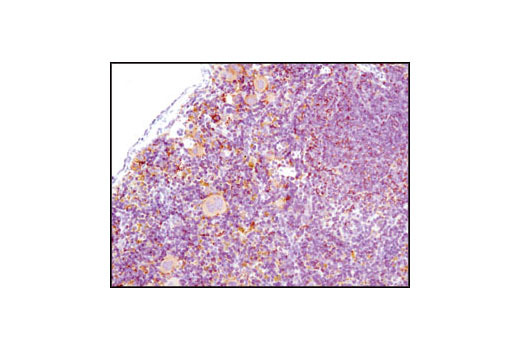 Immunohistochemical analysis of paraffin-embedded mouse spleen using HS1 (D5A9) XP® Rabbit mAb (Rodent Specific). 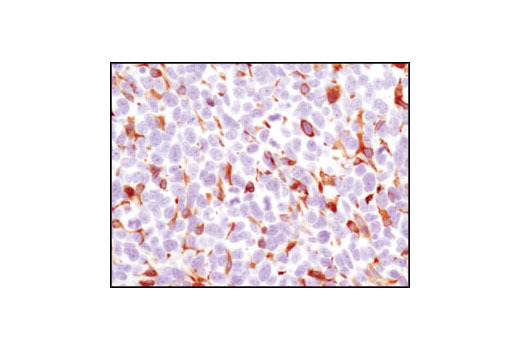 Immunohistochemical analysis of paraffin-embedded LL2 syngeneic tumor using HS1 (D5A9) XP® Rabbit mAb (Rodent Specific). 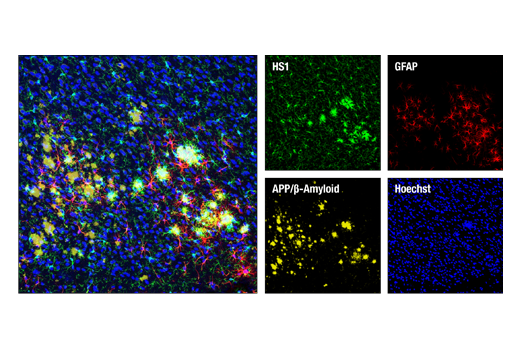 Confocal immunofluorescent analysis of mouse Tg2576 brain which overexpresses mutant human APP695. Sections were first labeled with HS1 (D5A9) XP® Rabbit mAb (Rodent Specific) (green) and APP/β-Amyloid (NAB228) Mouse mAb #2450 (yellow). After blocking free secondary binding sites with Mouse (G3A1) mAb IgG1 Isotype Control #5415, sections were incubated with GFAP (GA5) Mouse mAb (Alexa Fluor® 647 Conjugate) #3657 (red). Nuclei were labeled with Hoechst 33342 #4082 (blue). Confocal immunofluorescent analysis of 32D cells (left) and C2C12 cells (right), using HS1 (D5A9) XP® Rabbit mAb (Rodent Specific) (green). Blue pseudocolor = DRAQ5® #4084 (fluorescent DNA dye). 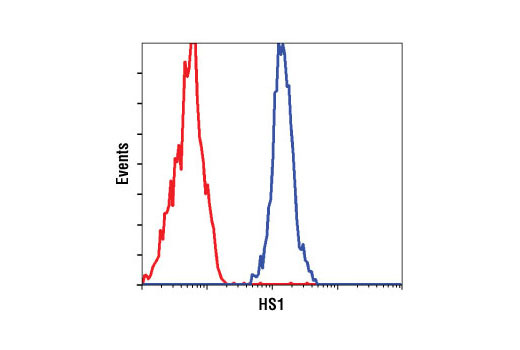 Flow cytometric analysis of NIH/3T3 cells (red) and 32D cells (blue), using HS1 (D5A9) XP® Rabbit mAb (Rodent Specific). 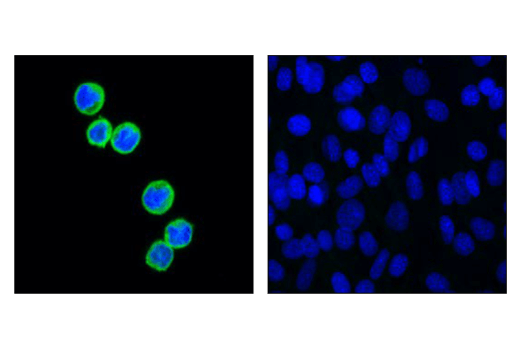 HS1 (D5A9) XP® Rabbit mAb (Rodent Specific) detects endogenous levels of total HS1 protein. 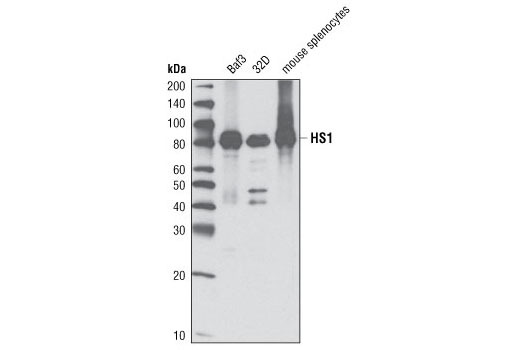 This antibody does not recognize human HS1 protein. HS1 has a calculated size of 54 kDa, but has an apparent molecular weight of 80 kDa on SDS-PAGE gels. Monoclonal antibody is produced by immunizing animals with a synthetic peptide corresponding to residues surrounding Leu310 of mouse HS1.